Hello, and good morning once again! 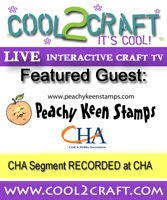 For my second post today, I've got my Peachy Keen Challenge card to share with you. There's a sketch challenge going on over at the Peachy Keen Stamps Challenge Blog, and I decided it's time to think Spring with this one. I don't know about the rest of you, but I'm sure ready! I think this sweet little chick is, too. She looks like she's singin' in the rain, and quite happy about it. This little cutie was stamped with PK-259 Shower Peepers in Memento tuxedo black ink, and colored with Copics. The designer paper is all from my scrap bin, including the cloud paper, which is a scrap of K&Co. paper I've been saving. For embellishments, there's of course the lace ribbon, yellow pearls, stickles (on the polka dots on the umbrella), and rain dots and splashes. I think a gentle rain would be kinda nice to make everything outside fresh and green things up a little bit, and from the looks of the day outside, it may just happen. Be sure to hop over to the Peachy Keen Challenge Blog to check out all the wonderful crafty goodness that my DT sisters have created to inspire you to join us for this challenge. While you're there, please take a minute to visit Stephanie at her Paper Creations Blog and welcome her as our guest designer. She'll be bringing you all kinds of wonderful things this week on the Home Blog, and I know you're going to love everything she creates!! I sure hope you can play along with our challenge. You've got two whole weeks to create something fabulous and upload it using the link provided. One lucky winner will be receiving the Spring Words stamp set from Peachy Keen Stamps, and it could be YOU!!! There's also a lot of excitement building for our next big (and I DO mean BIG) release at Peachy Keen Stamps. Starting next week, you'll be seeing some sneak peeking going on, with the actual release of the new stamping goodness scheduled for April 1st, when we'll all be blog hoppin' fools! LOL!!!!! I'm so excited that I can hardly stand it! This release is so awesome, and I can't wait for you to see it!! Once again, I want to thank you for stopping by. Have a bright and beautiful day and happy stamping! Your card is beautiful! I am at a loss for words. I feel like I say the same thing over and over. You simply AMAZE me! Wow Lorie!! you've gone and done it again. More seriously brilliant colouring and fabulous design. You are THE Copic Colouring Queen! LOVE your cute scene with those fluffy (and wet) clouds! Amazing talent. Just amazing my friend! Very cute! I like the clouds! Totally adorable! Your coloring is fabulous, and everything just goes together perfectly! Super great job on the sketch,It is sooo CUTE!!! How cute and appropriate! We sure have the rainy spring days going on here.. I love your happy colors - such a cute card almost makes it okay that it's rained 4 days in a row! Adorable! You do such a great job creating scenes...this is something I totally need to take in. I always end up cutting all my immies out! what a very sweet card! I love chicks! You blow me away with you coloring! I know I say that every time. This is one of my favorite cards you have made. Perfect!